"The chemical composition of the Paluxy water is variable. Some of the waters are NaCl water, similar to Woodbine, whereas others are Na-Ca-Cl waters and appear intermediary between the chemical composition of Woodbine waters and Travis Peak or Glen Rose waters. The chemistry and hydrology suggest that waters from the Glen Rose and Travis Peak Formations are leaking into the Paluxy" (Kreitler and others, 1983, p. 105). 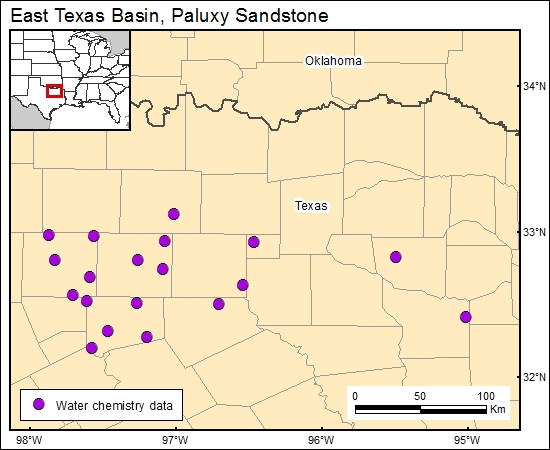 Kreitler, C. W., Collins, E. W., Fogg, G. E., Jackson, M., and Seni, S. J., 1983, Hydrogeologic characterization of the saline aquifers, East Texas Basin: implications to nuclear waste storage in East Texas salt domes: The University of Texas at Austin, Bureau of Economic Geology, report prepared for U.S. Department of Energy under contract no. DE-AC97-80ET46617.